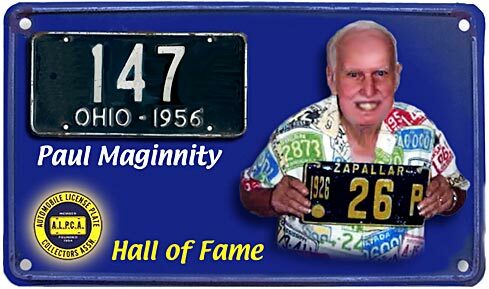 Dr. Paul Maginnity served ALPCA in every position that needed someone with dedication, skill and intelligence. Paul was born in Albany, New York in 1919. He began collecting plates seriously in 1948. He served as Club Director from 1967 until 1969 and again in 1971 until elected President in 1972-1973. He hosted the national convention in Westerville, Ohio in 1966 and again in Columbus, Ohio in 1971. He served another term as Director in 1974-1975 before resigning to take on temporary service as newsletter editor. This "temporary" assignment continued for twenty-two years until the desire to slow down led to semi-retirement in 1996. Even in semi-retirement he was available as a source of information and materials. He served as the Chairman ex- officio of the Hall of Fame project. His contributions to the project have been invaluable. Paul's newsletter was the premier house organ that helped identify the club as the place to be to collect license plates. He set the standard that all who have followed have tried to emulate. Paul was a chemistry professor at Boston College from 1946- 1952. Prior to that he was a member of a team of young chemists working for the United States Government on the top secret Manhattan Project, which resulted in the development of the atomic bomb. He went on to be a consultant for the U.S. Army General staff in 1952-1953 before joining Callery Chemical Co. in Pennsylvania as a research chemist and technical editor. He moved on to Chemical Abstracts in Columbus, Ohio where he was Associate Editor from 1958 to 1974. A world traveler he has collected and written about plates from the four corners of the earth. His work in chronicling the plates of Mexico was the first organized effort within the club. The Maginnitys were living in Zelienople, Pennsylvania when he first learned about ALPCA. Communication with Secretary Asa Colby led to his joining in 1956. Paul wrote that one of the benefits of this hobby is that there are a number of enjoyable related activities, such as making new friends and finding out about the design and manufacture of plates, just to name a few. But probably the most noticeable "side effect" of plate collecting is the increase in the geographical knowledge gained by the collector. For his outstanding dedication to ALPCA the Hall of Fame is privileged to welcome Dr. Paul Maginnity to its ranks. Dr. Paul passed away in March, 2009. He will be missed.